= Disconaias purpuriata Say, 1831. — Bogan (2010). = Disconaias purpuriata (Say, 1831). — Graf & Cummings (2007). = Lampsilis (Disconaias) purpuriata (Say, 1831). — Haas (1969). = Lampsilis (Disconaias) purpuriatus (Say). — Haas (1929). + Lampsilis (Disconaias) pilsbryana Frierson, 1927. — Frierson (1927). = Lampsilis (Disconaias) purpuriata (Say, 1831). — Frierson (1927).
? cf. Unio purpuriatus Say, 1831. — Simpson (1914). + Nephronaias aztecorum (Philippi, 1847). — Simpson (1914).
? Nephronaias medellina (Lea, 1838). — Simpson (1914).
? Unio (Elliptio) medellinus Lea, 1838. — Martens (1900). ‘Say’ Küster, 1861, Conchyl. Cab. : 162. ‘Philippi’ Martens, 1900, Biol. Centr.-Amer., Moll. : pl. 37, figs. 2-2a [in part]. ‘Lea’ Pilsbry, 1910, Proc. Acad. Nat. Sci. : 533. 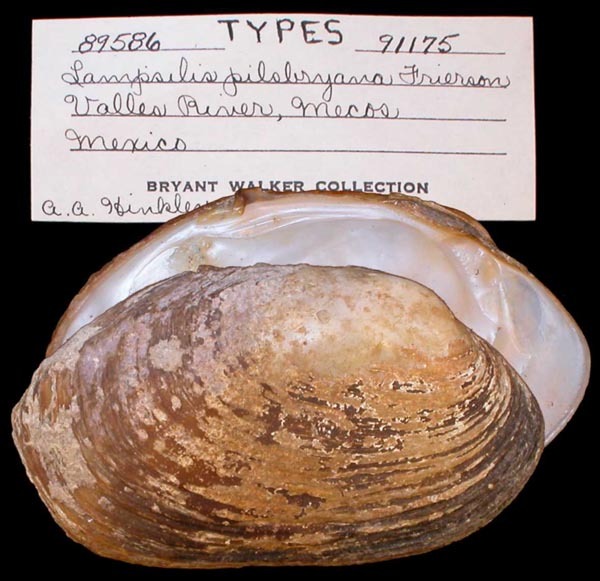 ‘Say’ Frierson, 1912, Nautilus: pl. 3, fig. 4. Lampsilis (Disconaias) pilsbryana Frierson, 1927. ‘Say’ Frierson, 1912, Nautilus: pl. 3, fig. 4 [as ‘Lampsilis purpuriatus’]. Frierson, 1927, Check List N. Amer. Naiades: 83, sp. 368. Type(s): HOLOTYPE UMMZ_91175, Valles River, Mecos, Mexico.